Working with kettle bells increases strength, endurance, agility and balance, challenging both muscular and cardio systems with dynamic, total-body movements. Whether you want to burn fat or develop your cardio fitness or increase your strength, it can all be done with a kettle bell. They feature an oversize powder coated handle that provides excellent grip whilst allowing for full and fluid motion. The base of each kettle bell is colour coded and covered with a heavy duty vinyl skin which helps to protect the floor. 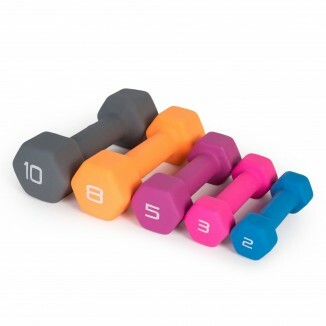 I f you are not sure which weight you need, here is a rough guide: W..
Neoprene coated dumbbells for aerobic and fitness training. Flat bottoms prevent weights from rolling away. Boxed in pairs. ..